Background: Fluoropyrimidines (FPs) have been used for a long time as first-line treatment for colorectal cancer and continue to represent the backbone of combination chemotherapy in both the adjuvant and metastatic disease settings. In a consistent percentage of patients (10-40%) FPs induce severe to life-threatening toxicity. On this basis, markers of tolerance to treatment need to be found. Dihydropyrimidine dehydrogenase (DPYD) pharmacogenetic screening is a useful tool to identify individuals at high risk of FPs severe toxicity. However, constitutional DPYD mutations only partially explain polymorphic DPD activity and toxic response. Recent advances in research have suggested that epigenetic mechanisms may provide a new source of explanations in the context of drugassociated toxicities. Objective and Methods: A systematic literature search of MEDLINE and EMBASE databases was performed in order to review the current state of knowledge about epigenetic aspects related to fluoropyrimidine- associated toxicities. 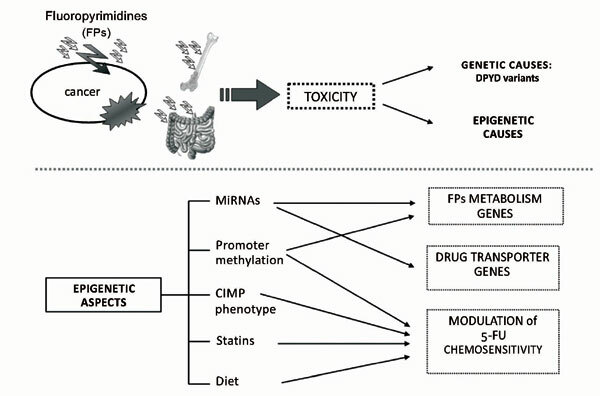 Results: Various genes and pathways involved in FPs metabolism and mechanism of action have been shown to be regulated by promoter methylation and specific miRNA expression at the transcriptional level, responsible for an intrinsic or acquired chemoresistance. Also, preclinical evidences are accumulating that epigenetic drugs may increase cell chemosensitivity. Conclusion: Associations between epigenetic patterns and effects of FPs have been outlined and some critical issues on the translation to clinical practice discussed. Colorectal cancer, 5-fluorouracil, fluoropyrimidine, toxicity, epigenetics, miRNA, dihydropyridine dehydrogenase, chemosensitivity.